Guerrilla Gardening is the act of gardening beyond our own back yards; sometimes without permission. It should be noted, however, it is never a guerrilla gardeners intention to do harm. snacks and a vegetarian lunch both days. Space is limited! Please register early to avoid disappointment. employed at the Permaculture Research Institute in Australia. Guerrilla Gardening is a rapidly growing social and environmental movement aimed at redefining the ways in which we use our public spaces. Guerilla Gardening touches on issues of beautification, naturalization, biodiversity, and food security. Guerrilla Gardeners typically target parking/vacant lots, unused public space, empty or unloved flower beds, and generally unsightly locations around their community by means of anonymous guerrilla gardening. Growing up in rural Alberta, Dustin Bajer became interested in pursuing different ways of combining urban and rural life; in particular, the creation of resilient communities more in tune to natural processes that sustain them. As an educator and permaculture designer, Dustin has taken to the act of guerrilla gardening to help achieve some of these goals. 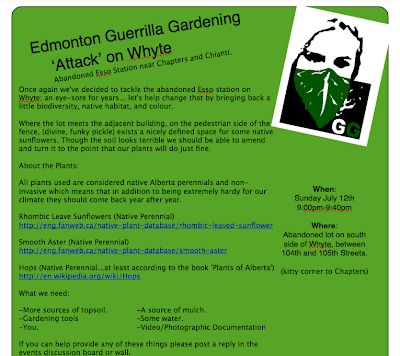 Dustin will be joining YEP-Edmonton to answer all your questions about the Guerilla Gardening movement in Edmonton! When: Wednesday, January 13, 5:30 p.m. I was chatting with some Guerrilla Gardening friends of mine when they began telling be about their window farm. Originating online at WindowFarms.org, window farms are..."
"...vertical, hydroponic, modular, low-energy, high-yield edible window gardens built using low-impact or recycled local materials". To see more from Dan & Chads check out their great blog, The Hands Create. Mid-Summer Kick Start Meeting July 9th! It would appear as though both myself and some Guerrilla activities have all but vanished in the past month. I am, however, done report cards, free from school and have the summer off. Late in the season it may be, but there are still many things to do. Not the least discussing some changes to the current group structure so that things don't grind to a halt when I'm tending to other commitments. I have 100 native perennial sunflowers sitting on my balcony... with the likely hood of being able to acquire more. I encourage as many people to come out as possible as I'd like a chance to re-brainstorm the workings, goals, and aspirations of the group. Hello Guerrillas, I have a few more updates for the moment. There is a potential for a lot of new projects in the near future. 1) First off, we're looking for some more people to help do some watering in the 118th Avenue area. We currently have to sites there are are thinking about maybe doing another. It would, however, be great to have a few extra people (especially those living in the area) to help with the occasional water run. 2) There is an old abandoned planter across from the carrot on 118th that i think would make an interesting vegetable garden, beans, tomatoes, beans, cucumbers, pears, etc. I'd like to partner with the community on this one as to help provide some regular watering (lest we find some more guerrillas in the area). Potential soil preparation this Friday. 3) The Edible Food Forest Project is soon set to be underway. I'm currently waiting upon a local permaculturalist who has agreed to take a look at the site and help us plan it out a little. Looking to get going sometime in the next week and a half. 4) Native plantings on Whyte. There are a couple of spots that I have in mind but I thought it would be great to take some of the many native perennial sunflowers (and other natives) on my balcony and find a home for them. Sites in mind: abandoned planters near Millcreek Bridge and along the old Esso station. Planting sometime in the next two weeks. It would appear as though we've been getting some good press this spring from some of the local magazines. The newest, by Andrew Paul, shows a softer, more cooperative side of the Guerrilla Gardeners. To see the whole article click here. To see past articles about Guerrilla Gardening in Edmonton check out the links under 'Publicity' on the right hand side. A quick note on the 118th Ave planting. This got off to a rough start with many nights of frost and some snow... it wasn't pretty. Recently, however, we (Dan, Chad, Mac, Tristyn, and I) revisited the site with some of our left over annuals. Many of the damaged plants were replaced and everything was given a good drink of water (Thank you for the extra water Carrot Community Cafe). I'm not usually into plugging any kind of promotion or company but I had spent a little time at the Strathcona farmers market last Saturday talking with Trace from Bedrock Seeds about bringing back many of the native Alberta plants that we've lost when he started telling me about Nativescape Alberta's 1 Meter of Prairie Promotion. 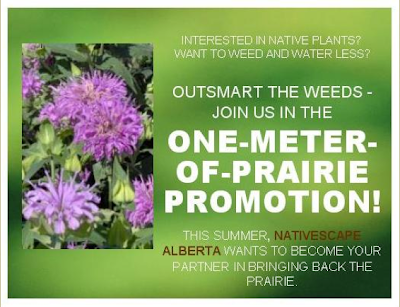 Essentially, a two for one deal on Alberta Native plants whereby if anyone purchasing a square meter worth of native prairie plants (72 plants ~$105) they will receive an additional 72 plants for free. It comes out to about 73 cents per plant.